Medicare isn’t known for surprises. When it proposes something for its annual update to the Physician Fee Schedule (PFS), there’s usually a long history of how that proposal came to be. The title of CMS’ recent press release about the PFS – CMS Proposes Historic Changes to Modernize Medicare and Restore the Doctor-Patient Relationship – should have been an indication that this time was different. But out of the 1,473 page proposal, there was one thing that was truly unexpected. They proposed paying doctors for virtual “check-ins” that help them know if patients need an office visit, using a new HCPCS code GVCI1. Paying doctors a little extra to be sure that a visit is necessary might sound obvious. After all, pre-scheduling visits whether or not they’re needed has helped make our healthcare system the most expensive in the world. There are approximately one billion office visits in the US each year (three per person per year, on average), and about half of those are with primary care physicians. But how many of those are truly necessary? What would happen if we reserved those visits for people who actually need to meet face-to-face with their doctors? To be clear, Medicare isn’t proposing reimbursement for using technology to replace the office visit. They’re already starting to do that. CMS, along with the AMA, has already expanded telehealth and remote patient monitoring reimbursement codes, although these, too, have gotten a big boost in the latest proposal. What I am talking about here is Medicare paying for technology used to justify a visit, or avoid a visit altogether. Think about that. In the past, unless a doctor was under a capitated or risk-bearing contract, they got paid on a time and materials basis. If they did something, they got paid. And if they chose not to do something, they didn’t get paid. Even if choosing not to do something saved the payor hundreds or even thousands of dollars, and saved the patient a lot of hassle. Doctors see patients because they’re paid to see patients. That’s how it works. Now, let that simmer for a minute. Assessing whether a patient needs a phone call or a visit based on the automated collection and analysis of their patient-generated health data (PGHD) is what technology can do efficiently at scale. This CMS proposal implies that if we can use technology to better make that determination, that should be separately billable. That’s big news. This puts some more specifics around the proposal, and the 5-10 minutes of medical discussion is particularly interesting. If a healthcare professional has a discussion with a patient by phone that doesn’t lead to a visit, they could bill for that. 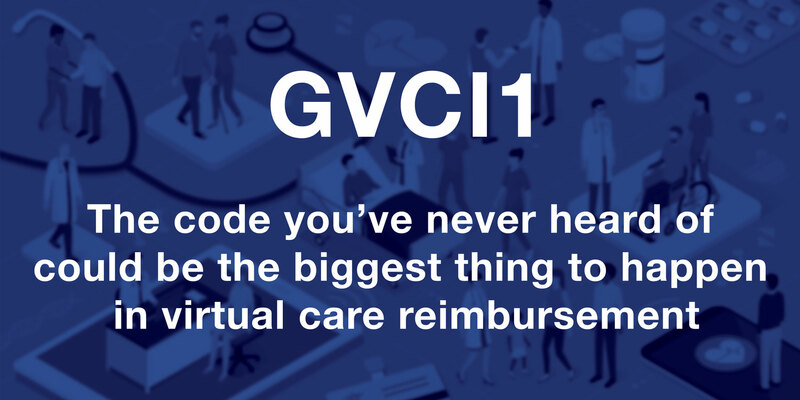 But if a healthcare professional has an automated system that is collecting PGHD to help determine the need for a call or a visit, that is a more scalable solution that meets the spirit, if not the letter, of the GCVI1 code. A patient is having headache symptoms. The patient calls and has a conversation with a physician about their headaches. The physician decides that the patient should come in a week later if the headaches persist, or sooner if they worsen. Otherwise, just take anti-inflammatories. The patient texts “Headache” to a short code phone number, e.g. 83973 (go ahead and try it). After a few questions, it’s likely that the patient has been experiencing tension headaches. They are advised by the chatbot that they should come in for a visit a week later if the headaches persist, or sooner if they worsen. The end result is the same. An unnecessary visit was avoided, reducing costs and inconvenience, and increasing satisfaction. It also kept an appointment slot available for someone having more urgent problems. The provider calls the patient to check on their blood sugars, ask about their mood, and make sure their prescription medications are still working for them. The provider determines that the patient is doing well and there is no need for an office visit, although they should swing by the lab to have their Hemoglobin A1c drawn. The patient proactively gets a notification that it’s time for their automated chat from their doctor (Text “diabetes” to 83973). The chatbot evaluates their most recent blood sugars, conducts a depression screen, and checks to make sure that they are tolerating their prescription medications well. The patient isn’t having any difficulty, and the bot lets them know that they don’t need an office visit, but that they should swing by the lab to have their Hemoglobin A1c drawn. The chatbot sends the order to the lab and texts driving directions to the patient. Again, the end result is the same. An unnecessary visit is avoided and the patient’s needs are supported. The automated conversation is also more likely to reliably surface all the relevant points versus a phone call (unless the practice uses a care management nurse, which is rare). The chatbot can be a lot more systematic, frequent, and analytic in determining whether a visit is needed than the personnel by phone could ever be. And the chatbot wins hands down when it comes to cost. At Conversa, a Conversational AI company, we’ve demonstrated that while a majority of patients have problems that need timely attention at some point in their health journey (about 75% of Medicare patients in the 30 days following their discharge from the hospital, and about half of those managing a chronic condition over the course of a year), the vast majority of these problems can be addressed with a simple phone call. For those managing a chronic illness and monitoring their health at home, an office visit is warranted for perhaps only 25% of patients in a given year. Let’s do some math. If you’re a physician who sees 20 patients a day, 4 days a week, 40 weeks a year, that amounts to rr 3,200 appointments available in a year. For 2,500 patients in a patient panel who currently see a doctor 3 times a year on average, that amounts to a need for 7,500 appointment slots per year. So we’re already at a capacity shortfall of over 50%. Primary care physician shortages are well documented and getting worse. According to a report by the Association of American Medical Colleges, by 2030, it’s expected that there will be a shortfall of between 14,800 and 49,300 primary care physicians. Using automated conversations to stay in touch with patients between visits can enable providers to more efficiently discover which patients need an office visit. If only 25% of patients need an office visit, that’s a need for only about 625 appointment spots. That leaves 2,600 appointment spots open for acute problems. And given that acute problems arise about once a year on average per patient, and if half of those can be handled with a phone call or telehealth visit, then acute issues would only require another 1,200 of those appointment slots. So this type of technology doesn’t just address the supply shortfall. It increases the efficient allocation of resources, effectively doubling the capacity of a medical practice. Instead of 2,500 patients, that physician could have a panel of 5,000 patients. The potential is enormous, but we need to think through the implications and risks, and CMS is already honing in on them. They ask if there should be a frequency cap on the use of the code, whether the code should be bundled with a visit if there was a recent visit (in the last 7 days) or a visit within the following 24 hours, and they ask how a physician would document the medical necessity of the check-in service. Medicare is not planning to apply any frequency limit, and so under this weekly scenario the $14 per interaction could add up quickly. But Medicare would still require that these virtual check-ins be reasonable and medically necessary and medically appropriate. So was this weekly frequency reasonable? Necessary? Appropriate? How often is too often? When is it not often enough to prevent the unnecessary visit? At Conversa, we now have a few years’ experience delivering virtual check-in services across a variety of patient populations, and we’ve found that the frequency of check-ins needs to be based on the patient’s unique circumstance. If the patient has just been discharged from the hospital, the check-ins must be more frequent to identify concerning issues that might arise such as fever, breathing trouble, or pain. For example, patients discharged from the hospital with heart failure need daily check-ins because symptoms of water retention need to be measured often. Similarly, patients with multiple chronic conditions or poor health status require more frequent check-ins. The reason is simple: The time between virtual check-ins should be no greater than the time in which something could arise that would become a bigger (and more costly) problem. The value is clear. Operationalizing it is the issue. It would be cumbersome and costly for CMS to constantly recalibrate the acceptable frequency of virtual check-ins based on each patient’s unique and ever-changing circumstances. And for all those check-ins that verify that a person is still doing fine, such as in the primary care scenario mentioned above, CMS might determine that $14 per check-in adds up a bit too quickly. So should CMS consider a limitation of, say, 5 check-ins per month? Or should we just see how GVCI1 is used in real life and adjust from there? To account for the value of these automated check-ins, but ensure that each reimbursement is aligned with an amount of medical discussion time, I would recommend that the 5-10 minutes of medical discussion be changed to medical review and/or discussion, and that it may be allowed to accumulate per patient. By allowing accumulation on a patient basis, you provide greater flexibility to the provider in how they realize the value of these modern virtual check-in modalities. I would also recommend that medical review and/or discussion should include time reviewing PGHD, discussion among care team members, or discussion with the patient or their caregiver. This is exactly how technology changes health care. It presents an opportunity for doing things better, faster, and cheaper, and then we figure out how we can incentivize it. Medicare rightly predicts that physicians will be concerned that virtual check-ins could hurt their pay. But as we have seen from the above scenario, this technology represents an opportunity to not just reduce unnecessary visits, but proactively identify patients who need the support of a call or a visit. This changes the physician’s patient mix. It should result in higher average E&M codes because the patients that are coming into the office have been identified as needing more intensive help. CMS states that with the 2019 PFS they want to help “Restore the Doctor-Patient Relationship”. This virtual check-in code could help do just that. Doctors staying in touch with their patients using technology, knowing how they’re doing in real time using PGHD, automatically delivering support and guidance when and where it’s needed, seeing the patients that need to be seen, and allowing patients who are doing well to live their lives and avoid the hassle of a doctor’s office visit. Now THAT would restore the doctor-patient relationship. For a more detailed technical analysis of all the new codes in the 2019 PFS, see this recent post by Jodi Daniel and Maya Uppaluru of Crowell and Moring.